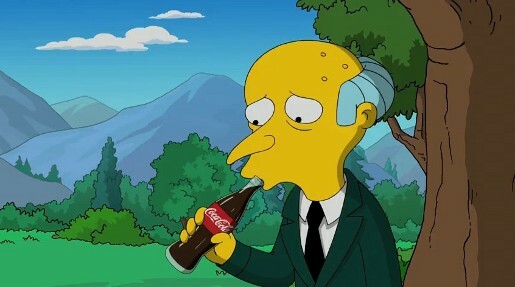 Coca Cola acknowledges the impact of the global financial crisis in “Hard Times”, a television commercial featuring Montgomery Burns, the stingy billionaire in The Simpsons. The TV ad, shown during the 2010 Super Bowl, shows a broke Burns learning to appreciate the simple things in life. The spot was promoted on Coca Cola’s Live Positively Facebok tab, offering visitors to the site a preview (and now the full video) in return for sending a friend a virtual bottle of Coke. The Hard Times commercial was developed at Wieden+Kennedy, Portland, by creative directors Hal Curtis and Sheena Brady, senior agency producer Matt Hunnicutt and account supervisor Ryan Peterson. Production was done by Gracie Films and Film Roman.